The Barshop JCC prides itself on creating an atmosphere of inclusivity, welcoming people of all ages and abilities while providing an environment that is accessible to individuals with mobility impairments and other disabilities. Accessible features include designated parking spaces, wheelchair access to all facilities via elevator as necessary, as well as accessible restrooms, telephones, drinking fountains, locker rooms, a barrier free beach front entry pool, and tennis courts. Our facility is equipped with both flashing light and audible alarm system. To accommodate those who are hearing impaired, the Holzman Auditorium is equipped with a hearing loop; individuals needing access to the hearing loop can make arrangements upon purchasing their event tickets or making their reservation. We also offer a variety of recreational programming and services, including wheelchair tennis, adaptive swim lessons, and personal trainers experienced in accommodating special needs circumstances. Select programs, such as our Summer J-Camp Inclusion Program, provide opportunities for children with special needs to participate. 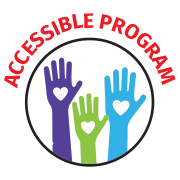 Look for this graphic on JCC programs that are accessible to individuals that are differently abled. For more information about programs and services available, contact Betsy Cowan, JCC Vice President/Chief Program Officer and Special Needs Project Manager, at (210) 302-6824.